Here at Westland London we pride ourselves in having a vast range of fine chimneypieces, but it is only occasionally that we source the truly exceptional; a combination of exquisite craftsmanship, quality of materials and elegant design. One fireplace in our collection certainly ticks all the boxes, having been designed by one of the greatest names in French design, François Linke. 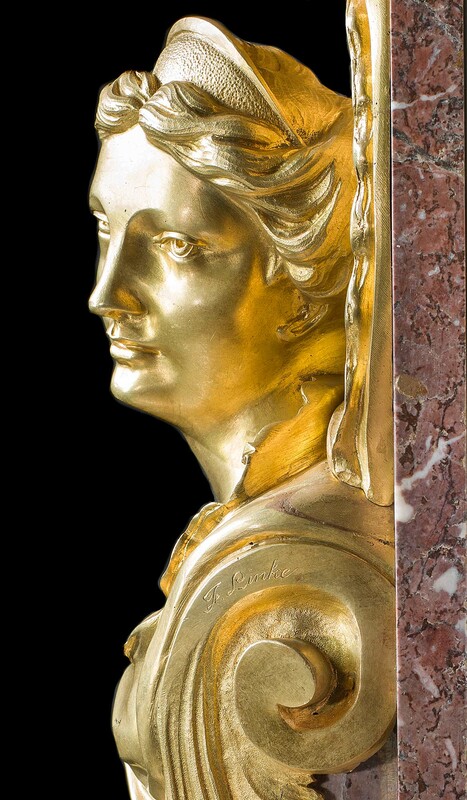 In the nineteenth-century, François Linke was considered one of the finest cabinet makers and designers in France, and one of the finest in the world. Born in the small village of Pankraz in Bohemia – now Jitrava in the Czech Republic – François Linke was the second son of eleven siblings. His father was a farmer and sent François to be apprenticed to a local cabinetmaker at just thirteen years of age, after which he settled in Paris in 1878; only five years after his apprenticeship had been completed. Linke in his study, c.1930. Signature on an ormolu mount. Linke’s work was so fine that he was invited to undertake an extraordinary commission to furnish the Ras al-Tin Palace in Alexandria with over 1,000 pieces of furniture and decoration for King Fuad of Egypt; the single largest furniture commission ever conceived, which eclipsed even Versailles. It is here that other examples of his exquisite marble and ormolu chimneypieces can be found. The designs for these majestic Rococo chimneypieces were in fact inspired by the chimneypieces of Versailles. These were designed in the late 18th century by Jacques Verberckt with gilt bronze mounts by Jacques Caffiéri. The two master craftsmen embodied the Louis XV Rocaille style of the eighteenth-century. When Linke and Messagé were allowed access to these designs, they sought to reproduce both the style and quality for a nineteenth-century audience. As a result, the Louis XV style saw a great revival. The chimneypiece in our collection has figural ormolu mounts almost identical to those found in the sumptuous Council Cabinet of Versailles. Linke has subtly updated the design by choosing a soft, fleur de pecher marble to provide the perfect backdrop for the glowing ormolu. This chimneypiece is a testament to both Linke and Messagé’s exquisite craftsmanship and represents the finest of nineteenth-century design. If you would like any further information about this piece, please do not hesitate to get in touch. We do very much hope that you enjoy our monthly newsletter, but if you would like to unsubscribe from our monthly newsletter, please click on “unsubscribe from this list” at the bottom of this email.